Over the past five years, I’ve written thousands of words about the scourge of gun violence in America. I was in Las Vegas and interviewed survivors the night of the worst mass shooting in modern American history. But two days after yet another massacre of innocents — this time in a high school in Parkland, Florida — it’s a good moment for those of us for whom gun violence is an abstraction to stand back, be silent, and instead listen to those who’ve experienced first-hand the terrifying and heartbreaking reality of America’s sick gun culture. — A text message from Sarah Crescitelli to her parents as the Parkland school shooting was happening. 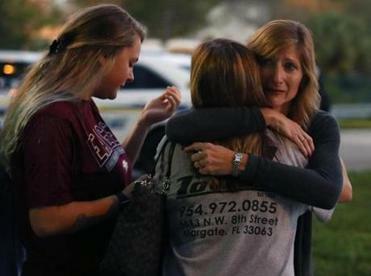 The mass public shooting has become a defining phenomenon of our age. — Morgan Williams, a student at Marjory Stoneman Douglas High School, who survived the shooting. — Lyliah Taylor, a student at Marjory Stoneman Douglas High School, who survived the shooting. — Fred Guttenbeg, whose 14-year-old daughter Jamie was killed on Wednesday. — Carly Novell, a student at Marjory Stoneman Douglas High School, who survived the shooting, responding to a tweet from conservative commentator Tomi Lahren chastising “the left” for pushing “their anti-gun and anti-gunowner agenda.” Ironically, Novell’s grandfather survived one of the country’s first mass shootings nearly 70 years ago. — Isabelle Robinson, a student at Marjory Stoneman Douglas High School, who survived the shooting. — Isabella Gomez, a student at Marjory Stoneman Douglas High School, who survived the shooting, when asked what she would say to President Trump. — Lori Aldaheff, whose 14-year-old daughter Alyssa was killed on Wednesday. — Melissa Falkowski, a teacher at Marjory Stoneman Douglas High School, who survived the shooting. — Cameron Kasky, a student at Marjory Stoneman Douglas High School, who survived the shooting. — David Hogg, a student at Marjory Stoneman Douglas High School, who survived the shooting. Don’t listen to the pundits on this one. Listen to the children, the teachers, the survivors, and the families of those who were killed on Wednesday — and get something done.